318 pages | 100 B/W Illus. The increasing importance of biomass as a renewable energy source has led to an acute need for reliable and detailed information on its assessment, consumption and supply. 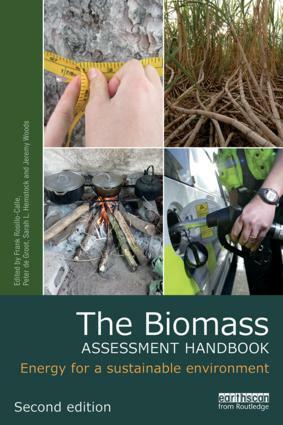 Responding to this need, and overcoming the lack of standardised measurement and accounting procedures, this best-selling handbook provides the reader with the skills to understand the biomass resource base, the tools to assess the resource, and explores the pros and cons of exploitation. This new edition has been fully updated and revised with new chapters on sustainability methodologies. Topics covered include assessment methods for woody and herbaceous biomass, biomass supply and consumption, land use change, remote sensing techniques, food security, sustainability and certification as well as vital policy issues. The book includes international case studies on techniques from measuring tree volume to transporting biomass, which help to illustrate step-by-step methods. Technical appendices offer a glossary of terms, energy units and other valuable resource data. Frank Rosillo-Calle is an Honorary Senior Research Fellow in Biomass Energy at the Centre for Environmental Policy, Imperial College London, UK, with over 30 years’ experience in biomass energy. Peter de Groot has worked in the field of renewable energy over 30 years and has been involved in many research projects including training courses for rural entrepreneurs. Sarah L. Hemstock is Project Team Leader for the University of the South Pacific-European Union Global Climate Change Alliance Project, based in Fiji. Jeremy Woods is a Lecturer in Bioenergy at Imperial College London's Centre for Environmental Policy. This series includes a wide range of inter-disciplinary approaches to bioenergy, integrating perspectives from both social and natural sciences. It draws on biology, agronomy, ecology, environment and sustainability science and policy, engineering, economics and other social sciences, and includes textbooks, research monographs and titles aimed at professionals, NGOs and policy-makers. Authors or editors of potential new titles should contact Hannah Ferguson, Editor (Hannah.Ferguson@tandf.co.uk).